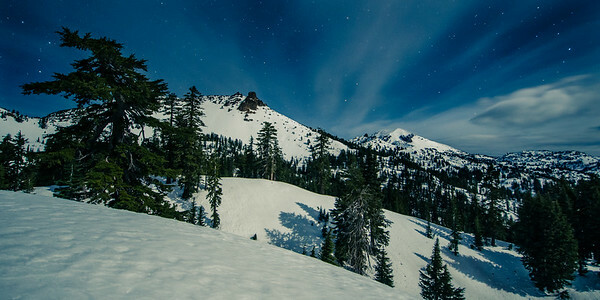 The best part of overnight snowshoeing trips is that there are very few other people around. In this case, there were none close enough to be aware of. The headlights of cars could still be seen on the distant horizon to the south, but Lassen Peak (right) and Mt. Diller (center left) blocked the remote chance of being bothered by lights to the north. I had hoped to make a star trail image on this adventure, but the weather did not allow. I still set up my camera to shoot a timelapse just in case the clouds cleared while I was sleeping. The clouds did not clear up but I did come back with some cool images like the one above. The combination of stars and moonlight, I have found, makes for very well lit nighttime photography. The moonlight also allows for using a lower ISO setting so that the final image is not overly grainy.